John Fleming was one of the three Founders of Rannoch School. John had immense charm, enthusiasm and his respect for young people allowed them to maximise their own potential. It was not what he said, it was what he was, and his influence on those who came under his guidance is now evident in many countries around the world. He was born in 1925 while his father was the Church of Scotland Minister in Doune, Perthshire before the family moved to Nethy Bridge in 1932. John was the younger of two children, whose parents were friendly with Kurt Hahn who famously invited himself for breakfast one morning. John was educated at Gordonstoun under Kurt Hahn and his philosophy would profoundly influence John's later approach to education. He trained with the RAF and got his wings on VE day so never saw active service. While serving in Rhodesia he flew Harvards and was capable of flying Spitfires but his passion was the thrill of aerobatics which he continued to practice after returning to Scotland and often performed private displays for his new wife Elizabeth and young family. After leaving the RAF, John trained at Aberdeen Teachers Training College, worked four years in State education spending his summer holidays with his family on Iona where he helped with the re-building of Iona Abbey. Camping at the North End, sadly no longer allowed, these were happy times for John and his family. 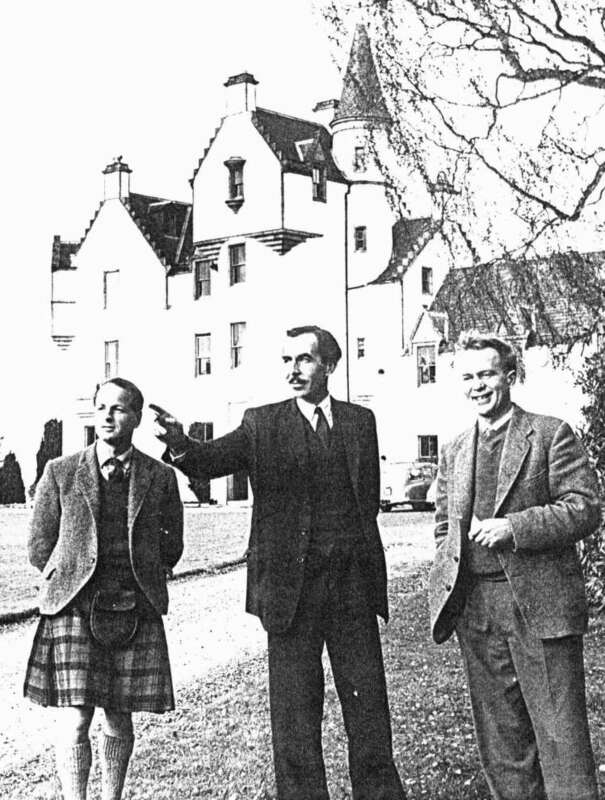 In 1953 he joined the staff at Altyre House, an independent part of Gordonstoun School and in 1957 the then Headmaster, Mr Chew asked several members of staff to investigate the possibility of finding another larger location for Altyre. Subsequently the Governors decided to re-build Altyre within the main school grounds so that another location was no longer necessary. However the idea of a smaller independent school had taken root. By 1958 John together with his colleagues, Pat Whitworth and Dougal Greig had found a property at Dall on Loch Rannoch, which was about to be sold by the Forestry Commission, their offer of £1500 for the property and twenty-five acres of land was accepted. Following considerable renovation and refurbishment - the replacement of 500 slates and the removal of wartime camouflage being minor considerations - John and his colleagues with a further 6 staff opened Rannoch School in September 1959, with 82 boys having originally expected an intake of between 30 to 40. Word spread rapidly and by their second term the roll had risen to 138 with Dougal Greig as Headmaster and John with Pat Whitworth being two of the four Housemasters. With Rannoch firmly established and offering a school experience not to be found elsewhere John and his family then moved to Box Hill School in Surrey before returning to Nethy Bridge in 1971 where he and later his son John developed one of the first self-catering holiday complexes, an early civic award winner. He served as a District Councillor and his expertise in building renovation helped when necessary improvements were required at the Abbeyfield House and at the Manse. At his memorial service held in Nethy Bridge on 11th November former Rannoch pupil David Mills spoke of his affection for both John and Elizabeth, their encouragement to dare to do the impossible and John's maxim, "if you put your mind to it, you can do it." The centrepiece at the memorial service was the simple wooden cross that John constructed for the Rannoch School Chapel. This cross originally stood against the clear glass window of the chapel while the birch trees of the Rannoch woods formed the backdrop. John, in his individual way touched so many lives, he firmly believed that in education, the development of trust was paramount, not enforced but nurtured while encouraging a degree of individual responsibility for the wider community which in the case of Rannoch pupils was initiated through the membership of one of the community services of Fire, Forestry, Ambulance, Emergency, Mountain Rescue, Loch Patrol and Building Maintenance. Earlier this year John and his family set off to revisit his beloved Iona for one last time, again a special time for them all, John's sense of humour, fun and daring coming out as he used full power of his motorised scooter both on and off-road to the amusement of his grandchildren just as he had done in his aerobatic displays for his children over 50 years ago. During his last year, through almost the only period of serious illness in his long and active life, John was cared for at home by his beloved wife of 57 years, Elizabeth supported by his children John and Valery. Contributed by former pupils of Rannoch School, early 2004.